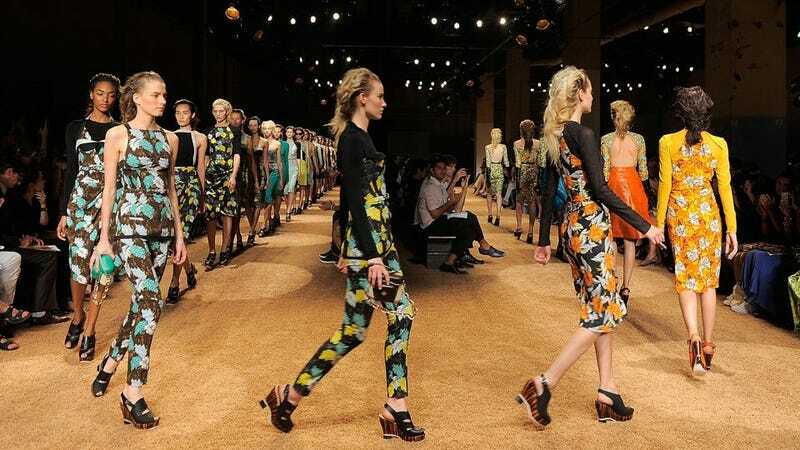 Proenza Schouler's spring collection was inspired, the designers said last night, by Googie architecture. Which, our room-mate with the M.A. in modern architectural history informs us, is a mid-century architectural subgenre associated with the west coast and car culture — ultramodern at the time, a little crass, a lot pop, and very commercialized. In case you didn't already know. The runway was covered in shag carpet, and the models wore wooden platform wedges. "Lost optimism," Lazaro Hernandez told Style.com, backstage. I loved a lot of the details — for instance how some of the plackets opened to reveal flashes of other fabrics. And it's nice to see a collection that isn't too literal about its inspiration. The designers took the ideas of Googie architecture and moved a couple steps beyond it, to explore what those old ideas about space — and, yes, the optimism of the Space Age — might mean in a contemporary context. I liked the silhouettes and the colors of the clothes, too.